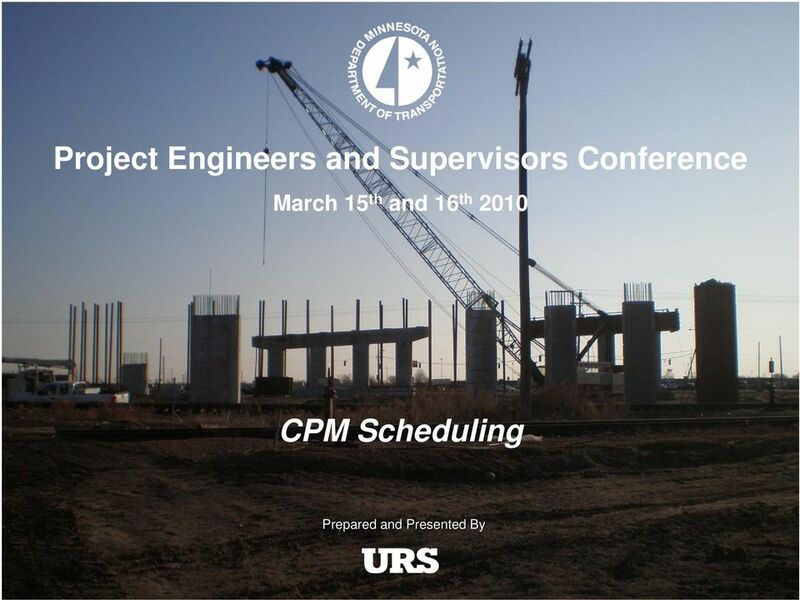 Download "Project Engineers and Supervisors Conference. 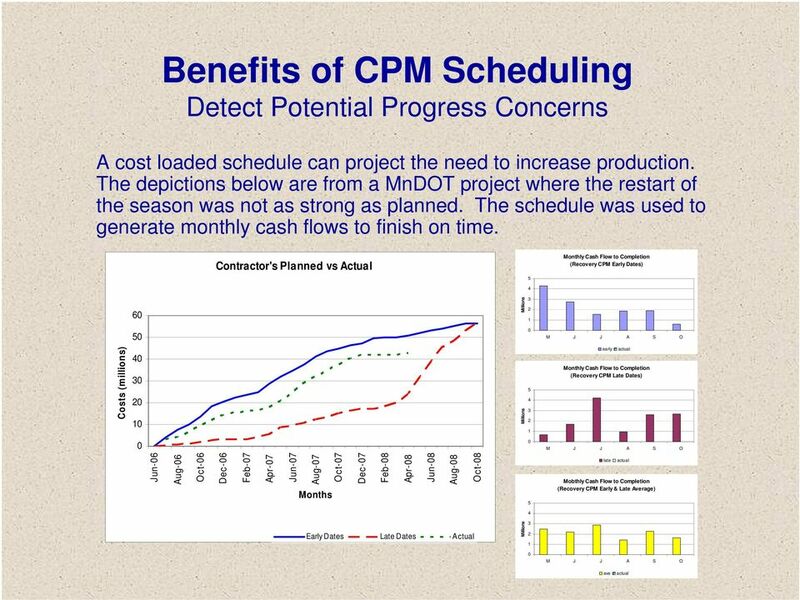 CPM Scheduling"
3 Benefits of CPM Scheduling More accurate cash flow projections. Can detect and substantiate potential progress concerns. Helps to fairly determine time issues here and now vs. later. Helps owner to formulate own opinion on status and issues. Opportunity to learn project complexities from the start. A well organized plan starts the job off right. Helps bring about an on-time finish and success. Increases potential for an earlier finish. 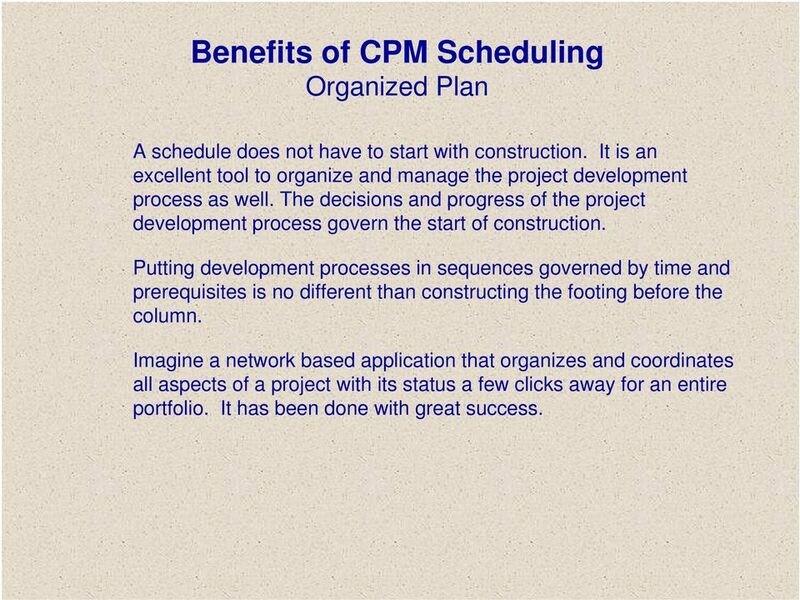 10 Benefits of CPM Scheduling Organized Plan A schedule does not have to start with construction. It is an excellent tool to organize and manage the project development process as well. The decisions and progress of the project development process govern the start of construction. Putting development processes in sequences governed by time and prerequisites is no different than constructing the footing before the column. Imagine a network based application that organizes and coordinates all aspects of a project with its status a few clicks away for an entire portfolio. It has been done with great success. 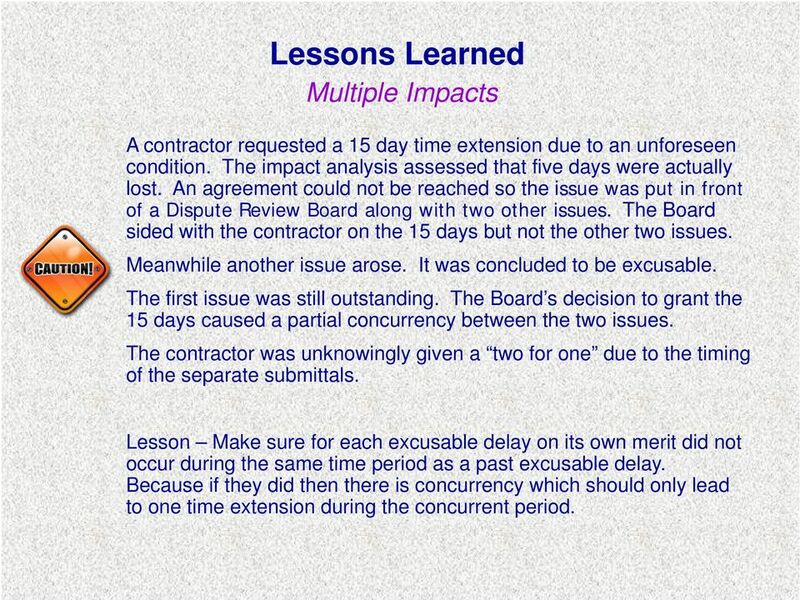 11 Lessons Learned Multiple Impacts A contractor requested a 15 day time extension due to an unforeseen condition. The impact analysis assessed that five days were actually lost. An agreement could not be reached so the issue was put in front of a Dispute Review Board along with two other issues. The Board sided with the contractor on the 15 days but not the other two issues. Meanwhile another issue arose. It was concluded to be excusable. The first issue was still outstanding. The Board s decision to grant the 15 days caused a partial concurrency between the two issues. The contractor was unknowingly given a two for one due to the timing of the separate submittals. Lesson Make sure for each excusable delay on its own merit did not occur during the same time period as a past excusable delay. Because if they did then there is concurrency which should only lead to one time extension during the concurrent period. 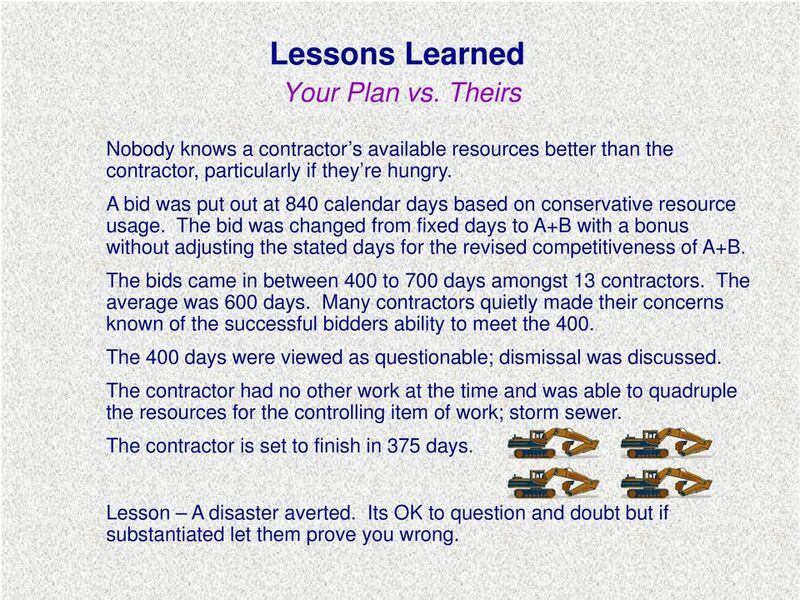 12 Lessons Learned Your Plan vs. Theirs Nobody knows a contractor s available resources better than the contractor, particularly if they re hungry. A bid was put out at 840 calendar days based on conservative resource usage. The bid was changed from fixed days to A+B with a bonus without adjusting the stated days for the revised competitiveness of A+B. The bids came in between 400 to 700 days amongst 13 contractors. The average was 600 days. Many contractors quietly made their concerns known of the successful bidders ability to meet the 400. The 400 days were viewed as questionable; dismissal was discussed. The contractor had no other work at the time and was able to quadruple the resources for the controlling item of work; storm sewer. The contractor is set to finish in 375 days. Lesson A disaster averted. Its OK to question and doubt but if substantiated let them prove you wrong. 13 Lessons Learned In charge yet in the middle; the Owner s spot in contracts Decisions between the owner and contractor can come back to haunt the owner if the owner looks to recover from a third party. 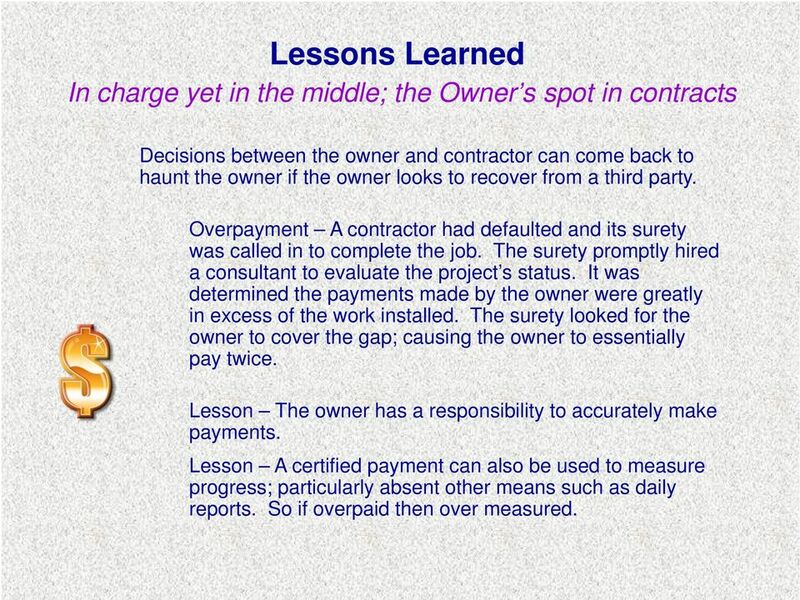 Overpayment A contractor had defaulted and its surety was called in to complete the job. The surety promptly hired a consultant to evaluate the project s status. It was determined the payments made by the owner were greatly in excess of the work installed. The surety looked for the owner to cover the gap; causing the owner to essentially pay twice. Lesson The owner has a responsibility to accurately make payments. Lesson A certified payment can also be used to measure progress; particularly absent other means such as daily reports. So if overpaid then over measured. 14 Lessons Learned In charge yet in the middle; the owner s spot in contracts Decisions between the owner and contractor can come back to haunt the owner if the owner looks to recover from a third party. 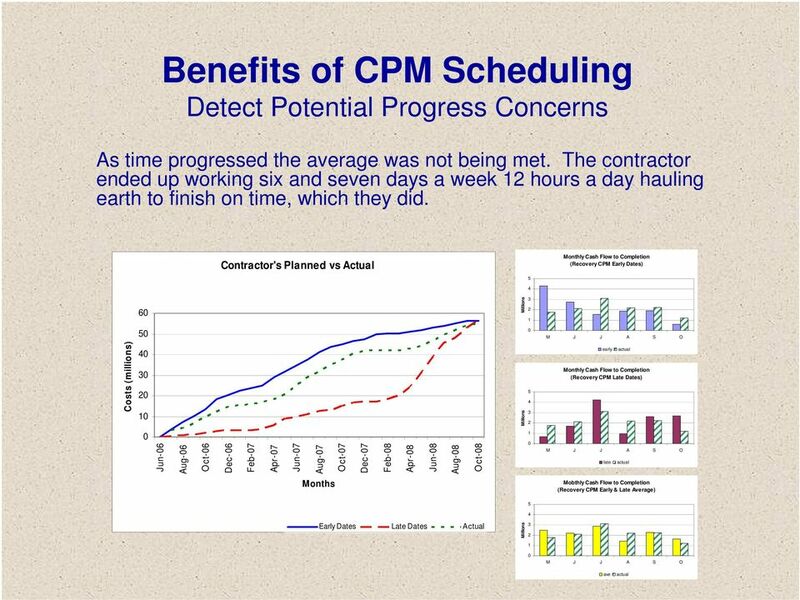 Ignoring Specifications An owner had knowingly ignored a specification requirement that did not allow a contractor to be paid overhead costs based on delay when overhead mark-ups were paid for via extra work to mitigate the delay or during a concurrent delay. 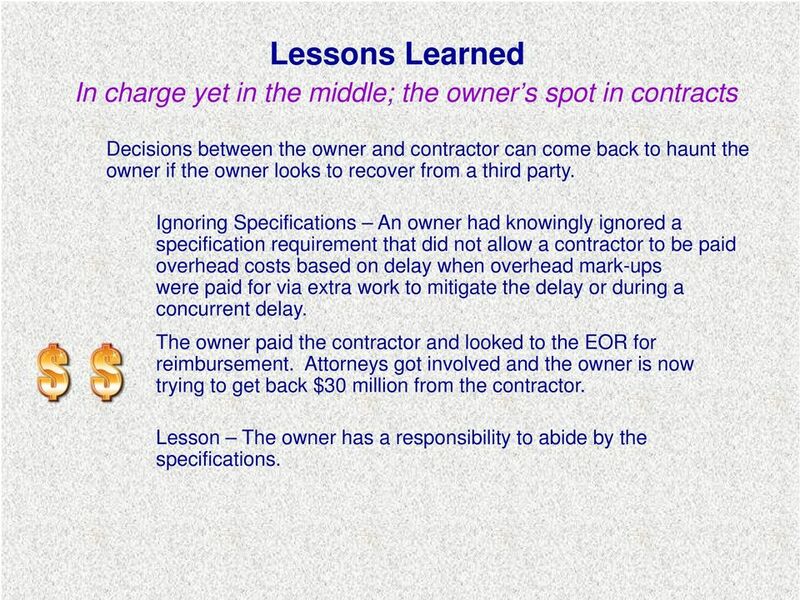 The owner paid the contractor and looked to the EOR for reimbursement. Attorneys got involved and the owner is now trying to get back $30 million from the contractor. Lesson The owner has a responsibility to abide by the specifications. 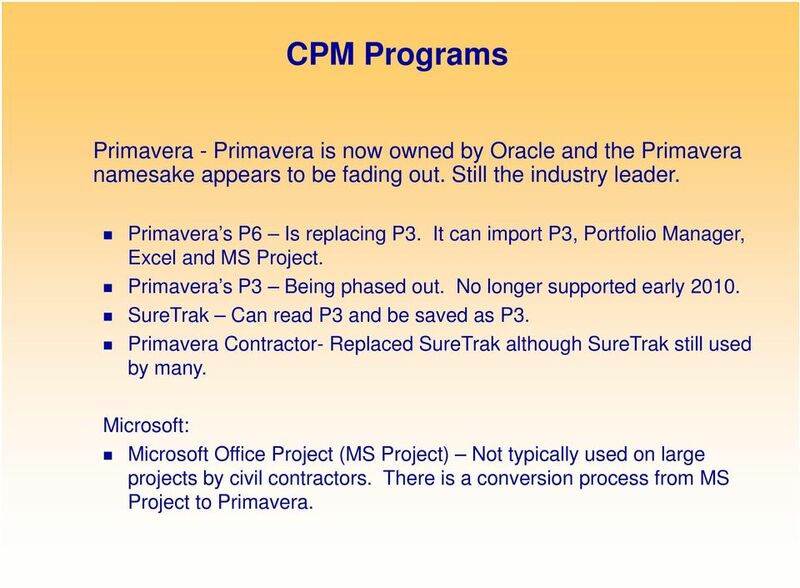 15 CPM Programs Primavera - Primavera is now owned by Oracle and the Primavera namesake appears to be fading out. Still the industry leader. Primavera s P6 Is replacing P3. It can import P3, Portfolio Manager, Excel and MS Project. Primavera s P3 Being phased out. No longer supported early SureTrak Can read P3 and be saved as P3. Primavera Contractor- Replaced SureTrak although SureTrak still used by many. Microsoft: Microsoft Office Project (MS Project) Not typically used on large projects by civil contractors. There is a conversion process from MS Project to Primavera. 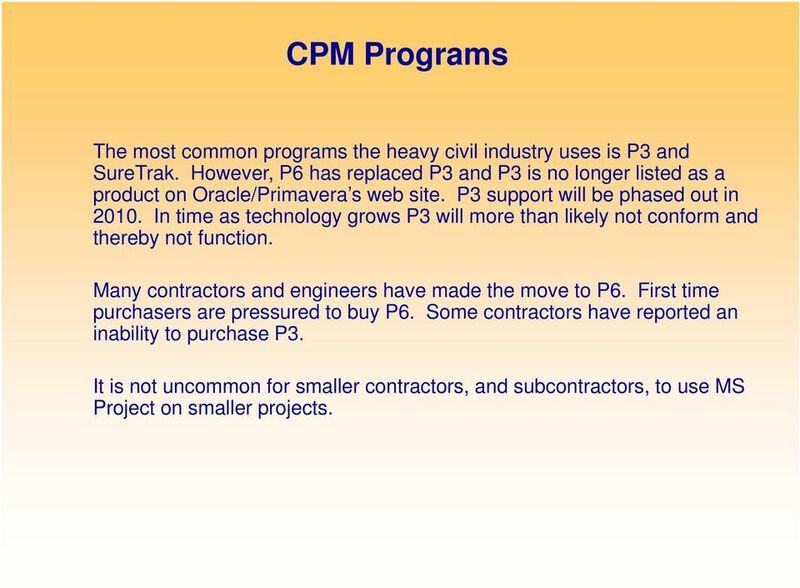 16 CPM Programs The most common programs the heavy civil industry uses is P3 and SureTrak. However, P6 has replaced P3 and P3 is no longer listed as a product on Oracle/Primavera s web site. P3 support will be phased out in In time as technology grows P3 will more than likely not conform and thereby not function. Many contractors and engineers have made the move to P6. First time purchasers are pressured to buy P6. Some contractors have reported an inability to purchase P3. It is not uncommon for smaller contractors, and subcontractors, to use MS Project on smaller projects. 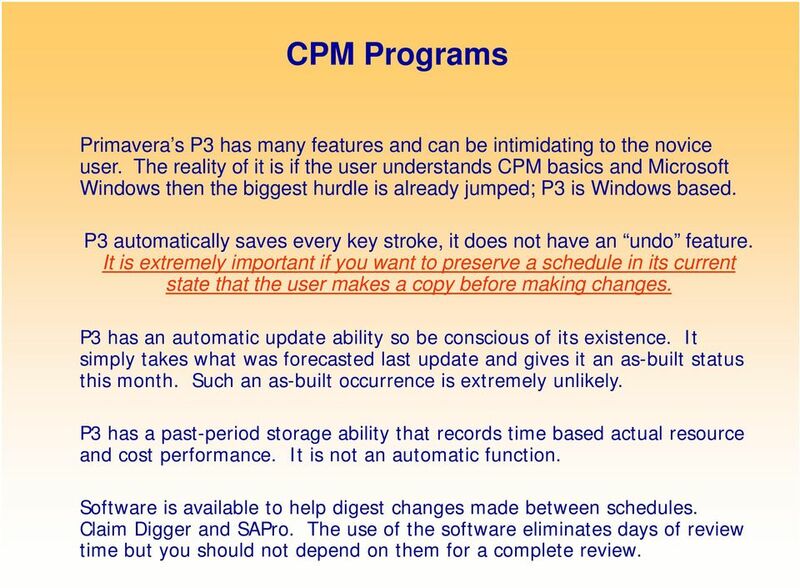 17 CPM Programs Primavera s P3 has many features and can be intimidating to the novice user. The reality of it is if the user understands CPM basics and Microsoft Windows then the biggest hurdle is already jumped; P3 is Windows based. P3 automatically saves every key stroke, it does not have an undo feature. It is extremely important if you want to preserve a schedule in its current state that the user makes a copy before making changes. P3 has an automatic update ability so be conscious of its existence. It simply takes what was forecasted last update and gives it an as-built status this month. Such an as-built occurrence is extremely unlikely. P3 has a past-period storage ability that records time based actual resource and cost performance. It is not an automatic function. Software is available to help digest changes made between schedules. Claim Digger and SAPro. The use of the software eliminates days of review time but you should not depend on them for a complete review. 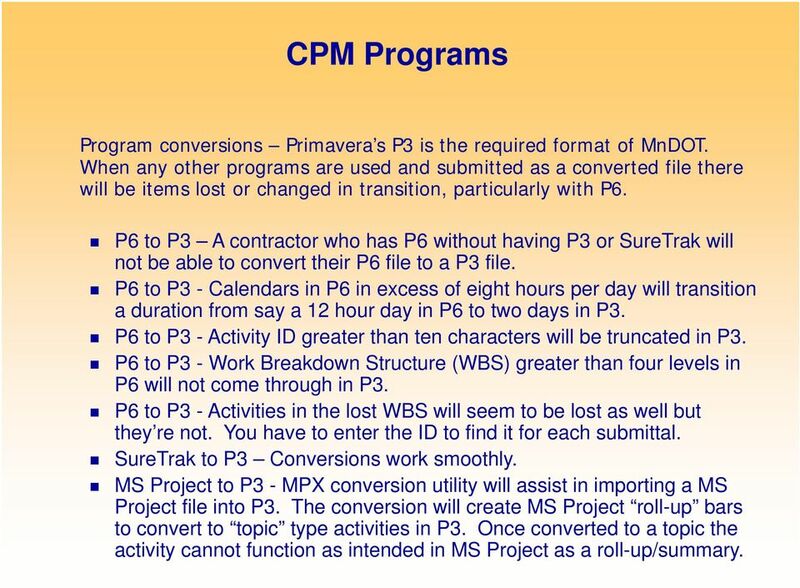 18 CPM Programs Program conversions Primavera s P3 is the required format of MnDOT. When any other programs are used and submitted as a converted file there will be items lost or changed in transition, particularly with P6. P6 to P3 A contractor who has P6 without having P3 or SureTrak will not be able to convert their P6 file to a P3 file. P6 to P3 - Calendars in P6 in excess of eight hours per day will transition a duration from say a 12 hour day in P6 to two days in P3. P6 to P3 - Activity ID greater than ten characters will be truncated in P3. P6 to P3 - Work Breakdown Structure (WBS) greater than four levels in P6 will not come through in P3. P6 to P3 - Activities in the lost WBS will seem to be lost as well but they re not. You have to enter the ID to find it for each submittal. SureTrak to P3 Conversions work smoothly. MS Project to P3 - MPX conversion utility will assist in importing a MS Project file into P3. The conversion will create MS Project roll-up bars to convert to topic type activities in P3. Once converted to a topic the activity cannot function as intended in MS Project as a roll-up/summary. 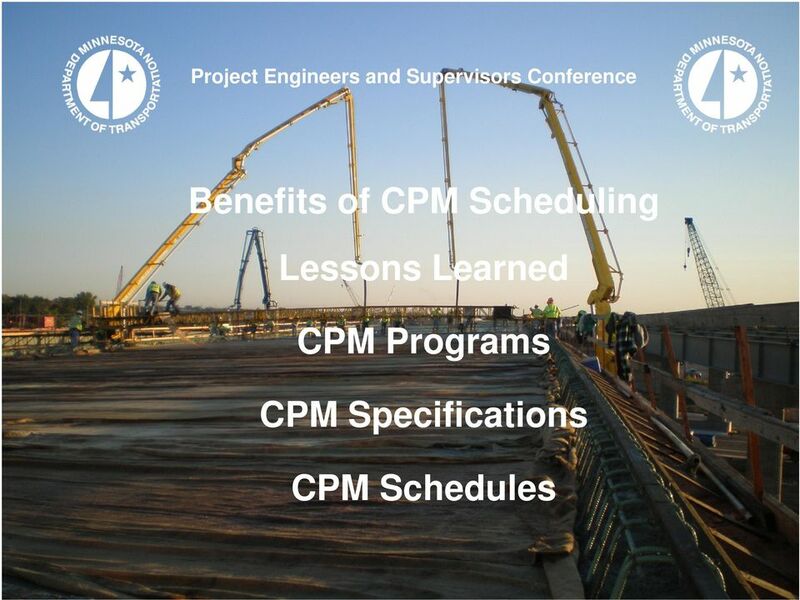 19 CPM Programs Some Highlights of P6 P6 was created with large entities in mind and is geared towards their network of project programs while at the same time being able to still provide the individual project needs of smaller entities. P6 can be loaded as a network version or stand-alone. The standalone version will permit P6 and P3 to remain in use on the same computer; the network version will not. P3 organized projects with a network of folders within MS Windows. P6 does not use Window folders; it uses a self contained Enterprise Project Structure (EPS) and is where you can find your projects. The EPS organizes and summarizes all projects for top-down cost and progress analysis. 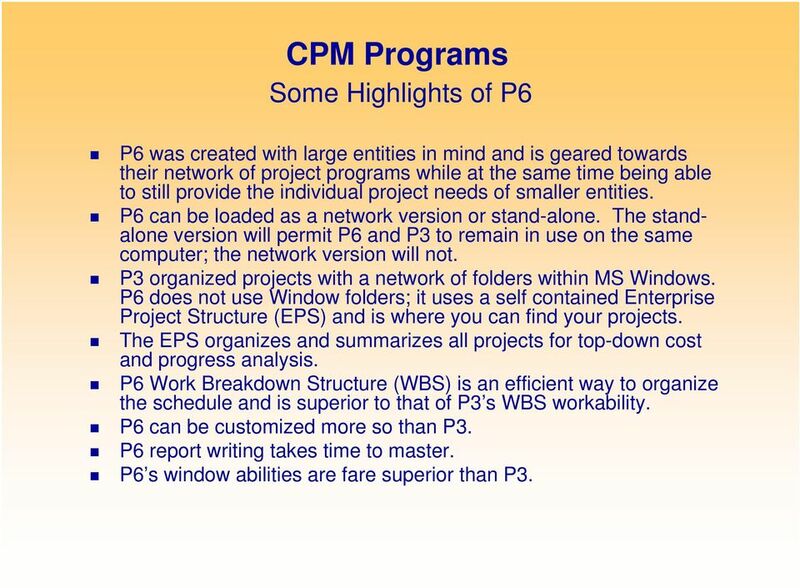 P6 Work Breakdown Structure (WBS) is an efficient way to organize the schedule and is superior to that of P3 s WBS workability. P6 can be customized more so than P3. P6 report writing takes time to master. P6 s window abilities are fare superior than P3. 22 Specifications Use It or Lose It An Owner s Duty to Enforce its CPM Specifications Inconsistency can make your next assignment more challenging when you start to hear you didn t enforce it the last time. Inconsistency places other contractors at a competitive disadvantage. The short of it is if you are going to have a specification then implement the specification. Inconsistency can only hurt and perhaps haunt you and others. 23 Specifications It is never smart to assume that the last set of specifications on a previous job is the same as the current job. The Standard Specification contains scheduling requirements under Prosecution of Work Section Since a Standard Specification has to cover every size project its requirements are rounded and general in nature. Special Provisions enhances the Standard based on a project s need. 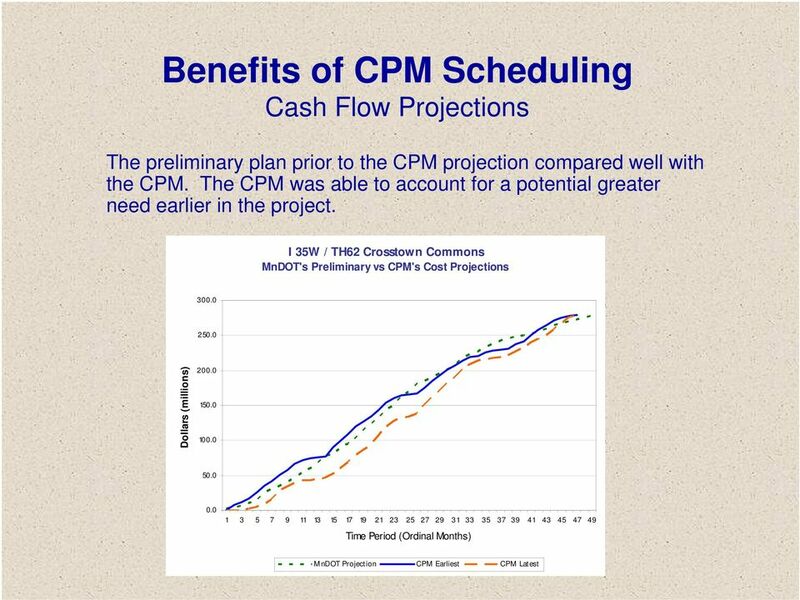 MnDOT makes use of three boiler plate scheduling specifications to be inserted within Special Provisions They re commonly referred to as CPM Full, CPM Lite and CPM Ultra Lite. All three have varying requirements and can be further adjusted per a project need. So don t ever assume it s the same as the previous project. 25 Specifications NTP1 and the Preliminary Schedule The Full, Lite and Ultra Lite specifications require a Preliminary Schedule within eight calendar days of issuance of Contract Award. Acceptance of the Preliminary Schedule is a condition of contract approval and NTP1. The Preliminary Schedule requirements for each specification may vary. The Full and Lite require the schedule to communicate an understanding of all milestone dates and a 30 day look-ahead. All schedules prior to Baseline acceptance are considered preliminary. Subsequent preliminary submittals are to show the status of the Work actually completed until accepted as the Baseline. The Full spec requires each subsequent preliminary submittal to maintain a 45 day look-ahead period to be in compliance with the Level of Detail section of the specification. The specifications provide monetary persuasion to bring about timely compliance. 26 Specifications NTP2 and the Baseline Schedule The Full, Lite and Ultra Lite specifications require a Baseline Schedule be accepted as a condition of NTP2. The Full specification allows up to 90 calendar days from NTP1 to issue NTP2. The Lite specification allows up to 30 calendar days from NTP1 to issue NTP2. The Ultra Lite specification allows up to 7 calendar days from NTP1 and does not permit any permanent work to take place prior to Baseline acceptance. 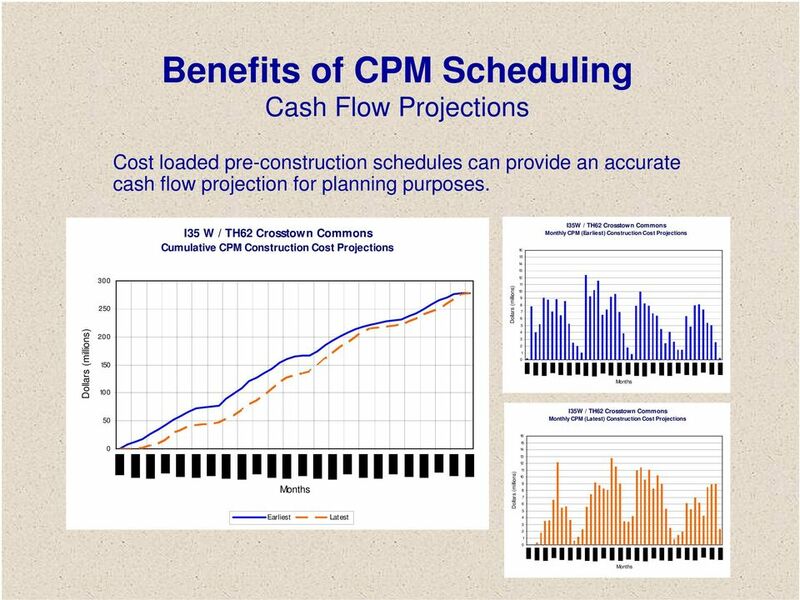 The differences in allowable time typically is based on the size and complexity of the project. 27 Specifications Calendars and Identified Contingency The standard contingency is 15 percent of the working days per calendar. But read the specification because depending on the project the weather contingency may vary. Contingency shall not be built into an activity duration. Doing so will skew any attempt to calculate a production rate for the work to be performed as represented by an activity. Multiple calendars are not a bad thing. They can be based on workdays per week, seasons of the year and operations. Seasonal calendars present a better representation of float and can diminish the use of lags. Nonetheless, multiple calendars will increase the difficulty factor in tracing float. 28 Specifications Calendars and Identified Contingency There are a few acceptable ways a contractor can include and identify the required contingency within the schedule. One option is to block out an otherwise typical workday as a non-workday. 29 Specifications Calendars and Identified Contingency Another is by the required workweek statement in conjunction with the schedule s calendar. A contractor may state in writing their plan to work 60 hours a week be it five 12 hour days or six 10 hour days; depending on weather during the week. In this case they should reflect a five day calendar. This will require an accurate daily recording of the hours worked by crew. 30 Specifications Float Suppression / Sequestered Float What is sequestered float? Sequestered Float - manipulations and techniques of network logic that diminishes, sequesters or removes float that would otherwise be available to both parties. Can be intentional or unintentional. If the overall float is excessively low then chances are some may be sequestered. Always review the longest path for sequestering techniques. If there are know issues within the design then review for sequestering techniques. 31 Specifications Float Suppression / Sequestered Float Techniques in sequestering float: Extended durations check production against other like activities. Excessive lags if it makes no sense then question it. Non-tangible logic if storm sewer not associated with a bridge but is tied to the bridge then question it. Crew logic is acceptable but still check it if it appears suspicious. Date constraints look for the asterisk next to the date. Float constraints if the predecessor and successor does not come close then question it. Calendar manipulation Look for excessive contingency. 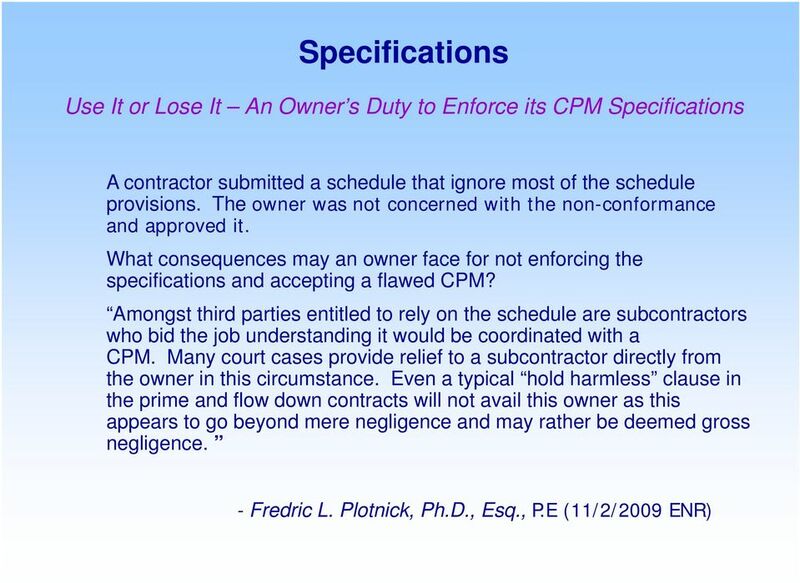 32 Specifications Other sections that go hand-in-hand with Section 1803 Critical Path Method (CPM) Scheduling are: 1804 Failure to Maintain Satisfactory Progress This is where the Working Schedule, Notice of Default and options under Non-Compliance are contractually linked Determination and Extension of Contract Time This is where you will find contractual dates and milestones. You will also find time limits on closures and date restrictions. This is a key section for reviewing a schedule Failure to Complete the Work on Time This is where liquidated damages are contractually linked to milestones and time restrictions. 33 Schedules File Maintenance It is important that every project maintain a separate file for schedules and one for scheduling correspondence. It is still a good ideal to have the correspondence and perhaps the schedules them selves maintained in the project s master file as well. Specifications will usually dictate what hard and soft copies the Contractor is to submit with each submission. The schedule file should easily identify which version of the schedules it contains. Other files to maintain separately are time/impact/delay issue files. If an issue comes to light that has been identified or even just hinted at being a schedule/time issue then start an Issue File on that subject. Put every piece of related correspondence into that file, including daily reports that mention the affected work and impact schedules. A separate look-ahead file should also be maintained. 34 Schedules Primavera P3 can be electronically transmitted in different ways. The most common is the.prx file. The.PRX file cannot be transmitted by from outside of MnDOT to MnDOT. This is because this file extension is an executable file and most systems will remove the file as an attachment from an for security reasons. Executable files are known to automatically open once clicked on and is a favorite for virus transmission. The.PRX can be uploaded and downloaded within Tracs. Bl00.prx Another means for ing a P3 file is to attach 17 individual files with a P3 emblem. These files can be ed to MnDOT. All you need to do is copy all files to your P3 folder and then simply open the file from within P3 as you would normally do. 35 Schedules Types of Schedules Preliminary Baseline The schedule submitted as the parties work towards a Baseline Schedule. The Preliminary Schedule acceptance is contingent for NTP1. Is the first accepted As-Planned Schedule that evolved from the Preliminary Schedule. The Baseline Schedule acceptance is contingent for NTP2. 36 Schedules Types of Schedules As-Planned As-Built Working Is the accepted Baseline Schedule without any actual status. However, depending on the specification the As-Planned may reflect actual status depending on the evolution of the Preliminary Schedule morphed into the Baseline. Is a schedule consisting of actual dates and all revisions and is often compared to the As-Planned Schedule. Often referred to as the Update. It is the most recently accepted schedule to be updated for the current working period. The most recent accepted Working Schedule is the schedule to be measured against. 37 Schedules Types of Schedules Impact Revised Used to demonstrate impact(s) of a change, proposed change, unforeseen condition or pure delay based on the latest accepted Working Schedule. An accepted Impact Schedule becomes the current Working Schedule. It is submitted via the Time Impact Analysis requirements of the specifications. Any accepted schedule that substantially differs from the plan depicted in the accepted Baseline Schedule. An accepted Revision Schedule becomes the current Working Schedule and is submitted via an Impact Schedule. 38 Schedules Types of Schedules Look-Ahead Typically a spreadsheet schedule used by field personnel presented at the weekly meeting. Typically contains detail and is limited to the known work to be performed. A good practice is one week behind and two weeks ahead. This schedule is to contain the Working Schedule activity ID s and likely will further breakdown the Working Schedule activity. 39 Schedules Preliminary All schedules submitted prior to Baseline acceptance are considered preliminary. The Preliminary Schedule is meant to communicate the Contractor s general plan of work and allow the Contractor to proceed with limited amount of work as the parties work toward Baseline acceptance. 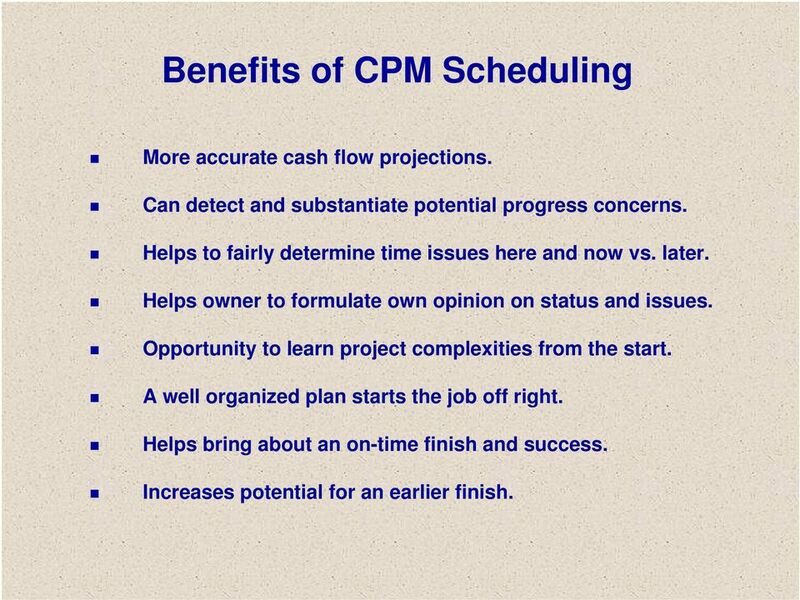 Projects that are subject to the CPM Full and Lite specification require an initial 30 day detailed look-ahead as part of the Preliminary Schedule. The CPM Full Specification also requires a rolling 45 day detailed lookahead after the Preliminary acceptance and continuing until Baseline acceptance. As-built data is to be incorporated into the rolling look a-head period. 40 Schedules Preliminary The primary function of the Preliminary Schedule is to communicate that all Milestone dates are understood and provide for a 30 day plan while the Baseline is being created. 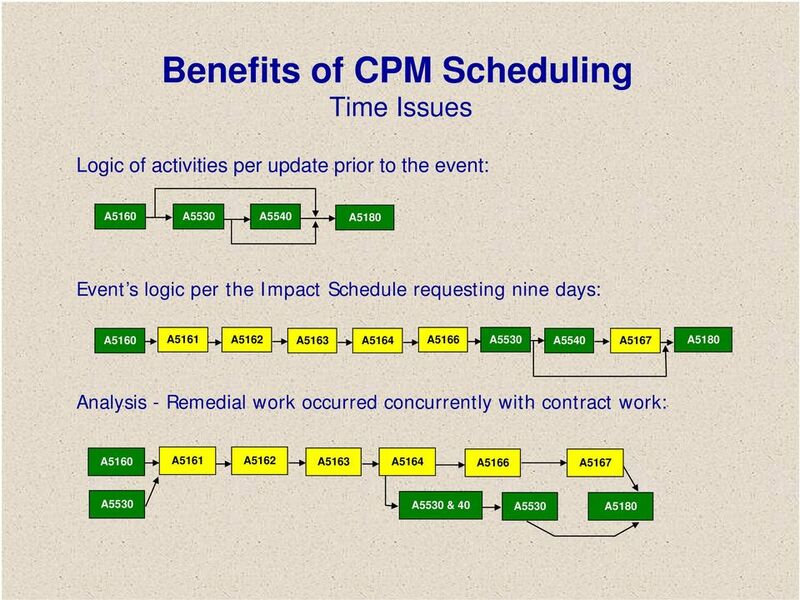 Steps to review a Preliminary Schedule: Confirm NTP and the Contract Completion Date (they are Milestones). If it is a calendar day project make sure the number of days matches the number per contract. Confirm all interim milestones and time restrictions are included. All milestones and time restrictions are to be expressed. If an area of work is restricted to say 14 days and falls within the first 30 days then it needs to be detailed. If beyond the 30 days then expression can be more of a summary. Review the schedule s content. Make sure it accounts for the major work items as depicted in the documents. The first 30 calendar days are to be detailed as if it were the Baseline. The remaining work items can be depicted in a preliminary sense to account for the remaining time. Any preliminary depiction would be replaced with detail as the Baseline evolves. 41 Schedules Baseline The Baseline Schedule shall not extend beyond any Contractual completion dates, contain negative float or utilize any other prohibited scheduling techniques. The Baseline Schedule shall include the entire scope of work and how the Contractor plans to complete all work contracted. The Baseline Schedule should contain no more than 20 percent critical activities, nor more than 30 percent near-critical, unless otherwise authorized by the Engineer. Critical is defined as zero days of float and near critical between one and ten days of float. Near critical amount may be higher depending on the project, check the specifications. Some Baselines will be required to be cost and resource loaded. 42 Schedules Baseline Steps to review a Baseline Schedule: Confirm NTP and the Contract Completion Date. If it is a calendar day project make sure the number of days matches the number per contract. Confirm all interim milestones are included and are per contract. Make sure the detail of a time restricted work area is within the defined restriction. Make sure you include the first and last day in the computation. Use the specifications as a check list. Review the schedule s composition as it relates to each specification requirement. Review the schedule s content. Make sure it accounts for all the work items as depicted in the documents. Make use of the tabulations. Ensure inclusion of utility relocations; focus on time sensitive utilities. 43 Schedules Baseline Steps to review a Baseline Schedule (Continued): Review the level of detail as you review content. The specifications may dictate the level. Some basic levels of detail: Bridges: piles, FRP footings, FRP columns, FRP caps, erect beams, FRP superstructure, rails, overlay and lighting. Storm sewer: by pipe run w/structure ID (account for all structures) Roadway: earthwork, tolerance, base, non-wearing course, wearing course. Submittals: submit, approve, procure (fabricate/deliver). Review the Traffic Control Plans and/or Staging / Phasing Plans to ensure that the schedule s logic coincides with the limitations of the Work. Review the float. Is there a lot of high levels of available float? Is there very little float? It would not be unreasonable if 20 to 25 percent of the schedule s activities were critical and 30 to 35 percent near critical. Some more linear projects near critical base could be as much as 50 percent. Critical is zero days of float and near critical is 10 days or less. Review the schedule s logic. Look for missing logic. For example; FRP Approach Slab as a predecessor to Traffic Railing Barrier. 44 Schedules Baseline Steps to review a Baseline Schedule (Continued): Review the schedule s logic (continued). Look for logic that makes no sense. For example; FRP Approach Slab as a predecessor to Install Sign Base for a sign that has no relation to the approach slab. Look for large lags. Some lags are legitimate. For Example; if there is a 5-day lag between Pour Deck and Strip Deck and both activities are on a 5-day calendar then this lag would more than likely be consideration for curing. However, if there is a 100-day lag then such would not be legitimate. Look for date constraints. Most date constraints are acceptable if they are a contractual imposed date on an interim milestone or completion date. But constraints that are not contractually imposed will artificially diminish, sequester, the true amount of available float. The easiest way to see if a constraint is being used is to look for an asterisk (*) next to the scheduled date. Look for excessive or generic durations. If all your abutment durations are say 30-days then they appear to be generic, no real thought put into them. If a duration equates to a low production rate then it appears excessive, unless otherwise explained. Activities that are same in nature can have their durations evaluated against one another and against industry standards. Are the production rates inconsistent? How do they compare to industry standards? However, keep in mind that circumstances may cause inconsistencies. 47 Schedules Update An updated Working Schedule is to be submitted with a data date of the 15 th of every month. An updated schedule is produced by adding actual progress into the Baseline Schedule or Working Schedule and includes activities that reflect progress and planned work. All progress consist of actual dates left of the data date. All planned work consist of planned dates to the right of the data date. The data date should coincide with that specified or the Application for Payment cut-off date. You should review the specifications to see if a response time is specified. Specification Section 1803 may require the Engineer to review and comment on the schedule within seven calendar days. Any required corrections are to be within seven calendar days after receipt of Engineer s comments. 48 Schedules Update Steps to review an Update Schedule: Confirm that the Contract Completion Date remains per Contract. If the completion date has gone beyond that per contract without a time extension or a pending excusable delay then the Update should not be accepted, unless otherwise allowed per Contract. If there is a pending excusable delay and there are no other problems with the Update than the Update could be Accepted As Noted. The note should make the acceptation contingent on a forth-coming time extension. Confirm all interim milestones are per Contract. Confirm the reflected progress is accurate. Overstated progress presents added time and float ahead of schedule when your not. Understated progress conceals available time and float behind schedule when your not. Review actual dates. Reconcile those you disagree with. Inaccurate progress reporting hinders reviews of potential impacts. If cost loaded the schedule s cost to date should match the amount paid to date. 49 Schedules Update Steps to review an Update Schedule (continued): Review the Update s content. Was anything added to or deleted from the schedule? Was anything changed, i.e. ; original durations, descriptions, logic, past actual dates? Pay attention to added logs. Tools to assist in your Update review. SA Pro 3 and Claim Digger. Both were specifically designed to evaluate changes between P3 schedules. They will identify all the changes made between two schedules. Shaves days off the review process. MnDOT s desk top provides SA Pro 3. What does the Update reveal about the Project s status? What is the reflected critical path, has it changed? What has become near critical? What does the overall float content look like? If it is behind schedule what is the driving cause? If cost loaded how much cost remain to be constructed compared to time remaining? For example; does it reflect 65% of cost to complete in only 30% of the time? 50 Schedules Update The Update Schedule should be accompanied by an update narrative. Specifications require a narrative be provided as part of the Update Schedule package. Items typically included in the narrative are: Schedule status. Longest path activities. Near critical activities Projected milestone and completion dates. Coordination with MnDOT and utilities or other third parties. Delays / problem areas and recovery plan, if applicable. Out-of-sequence work, and reasons why with effects of. Changes to the schedule, and reasons why with effects of. 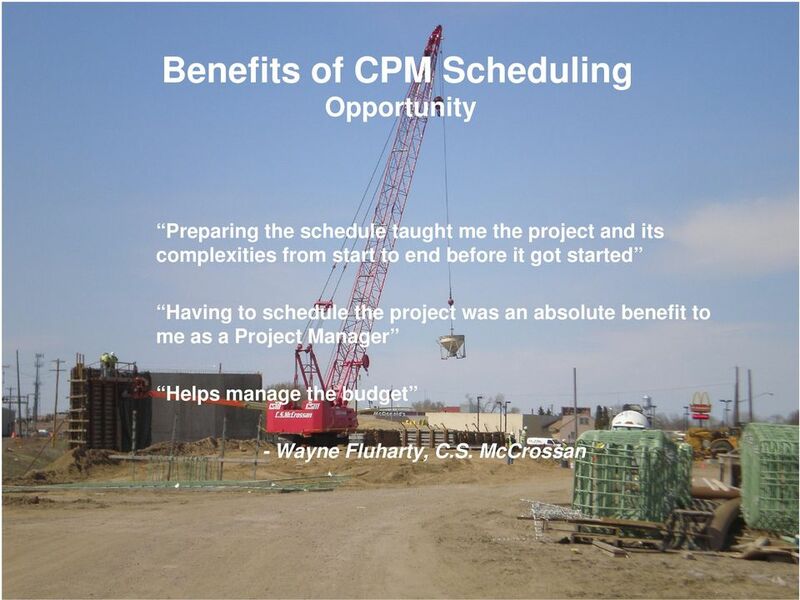 Strategies for creating accurate updates of CPM construction schedules.